How Are Construction Workers Most Likely to Get Hurt? In 2017, 5,147 Americans were killed on the job — an average of 14 deaths each day. Construction workers account for more than 20% of these fatalities. OSHA estimates that eliminating the Fatal Four jobsite hazards could save the lives of 508 workers each year and prevent countless construction-related injuries. Falls: Falls are the most common type of injury sustained by construction workers. As of 2017, fatal falls accounted for 39.2% of all construction workplace deaths. 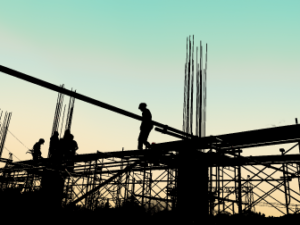 Despite the prevalence of fall-related injuries, many construction sites remain improperly equipped for worker safety. Struck by Object: In 2017, nearly 8% of construction site fatalities resulted when a worker was struck by an object on the job, makingstruck-by-object cases the second leading cause of worksite deaths. These incidents include injury by falling objects (e.g., suspended loads); flying objects (tools, debris); swinging loads; and rolling (vehicles or heavy machinery). Electrocution: Electrical hazards cause more than 4,000 worker injuries and 300 deaths per year. Of the “Fatal Four,” electrical injuries are the most easily prevented when appropriate safety measures are taken by both employers and employees. Caught In or Between Equipment or Objects: The fourth leading cause of worksite injury involves accidents in which a worker is caught, squeezed, or crushed between two or more objects, and may involve collapsing materials, equipment rollovers, or body parts being pulled into machinery. What Can Construction Workers Do to Stay Safe in the Workplace? What Can Employers Do to Keep Workers Safe?